Clinton-Massie’s Jake Vaughan (3) runs the ball as Clayton Sheeley (43), Seth Schmidt (50) and Brendan Lamb (23) block against Miami Trace Friday night. 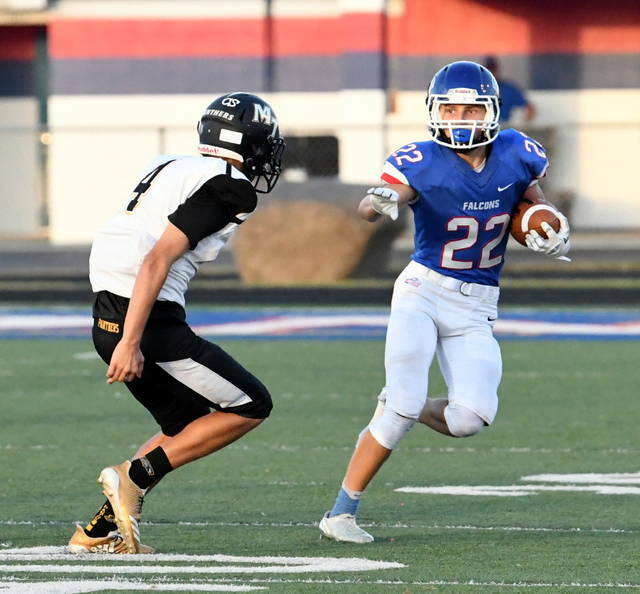 ADAMS TOWNSHIP – Brendan Lamb chopped his way through Miami Trace Friday for 173 yards and four touchdowns on 12 carries to help lead Clinton-Massie to a 54-0 victory, its 62nd straight over a team from the old South Central Ohio League. After opening the season with three straight road games, this was Clinton-Massie’s first game at Frank M. Irelan Field. Lamb, who didn’t play the second half, pretty much danced past the Panthers untouched on his scoring romps, one of which came after a MT fumble and another after he hauled in a 35-yard pass to the 9. His other scores capped two-play drives. The Falcons (3-1 on the year) were dominant up front, overpowering the Panthers (2-2) for 528 rushing yards on 43 attempts. 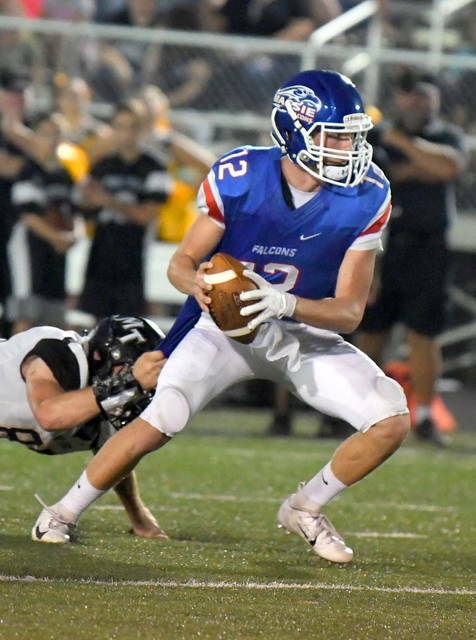 Despite coming up scoreless in the first half, Miami Trace was able to penetrate Falcon territory. The fumble setting up Lamb’s first score came at the Massie 38. MT also made it to the Massie 1 before having a touchdown negated by an offensive pass interference penalty and missing a 36-yard field goal attempt. The Panthers’ last drive of the first half also reached Falcon territory. 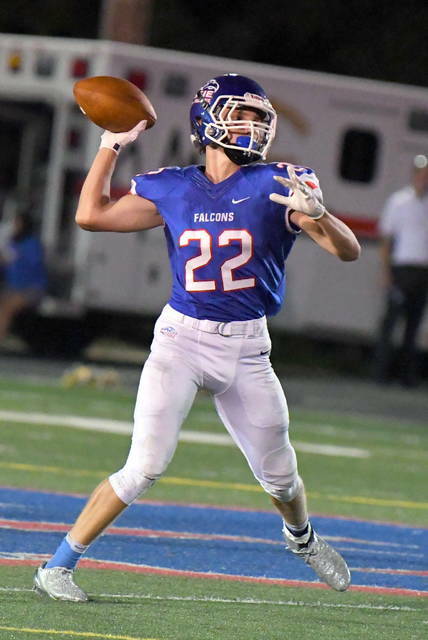 Jake Vaughan got the Falcons on the board first with an 11-yard run that capped Massie’s game-opening 11-play, 73-yard drive that chewed up nearly half the opening period. He also finished Massie’s opening drive of the second half with a 31-yard run to put the Falcons up 40-0. Robby Frederick and Carson VanHoose tacked on Massie’s other second-half scores. 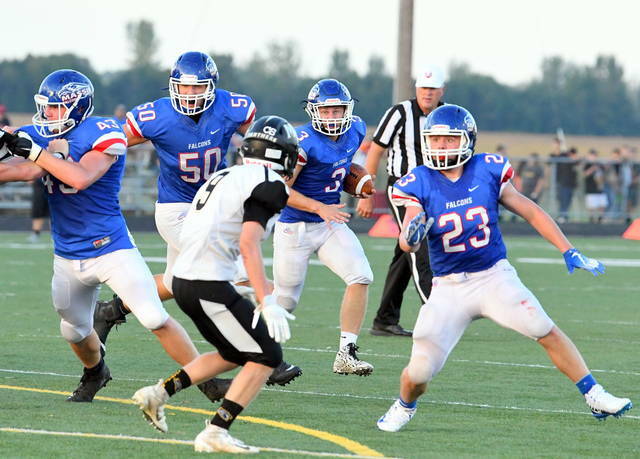 Frederick trucked a Panther on a 62-yard touchdown run while VanHoose darted 22 yards around end near the end of the game. CM – Vaughan 11 run (Kick failed), 6:21. CM – Lamb 50 run (Kick failed), 10:57. CM – Lamb 9 run (Avey kick), 6:03. CM – Lamb 51 run (Avey kick), 3:53. CM – Lamb 36 run (Avey kick), :50.1. CM – Vaughan 30 run (Avey kick), 6:21. CM – Frederick 62 run (Avey kick), 1:25. CM – VanHoose 22 run (Avey kick), 2:05. RUSHING – Miami Trace Sweitzer 12-30, Mayer 2-16, Taylor 2-6, Amore 3-0, Total 19-52. Clinton-Massie Lamb 12-173, Vaughan 10-129, Frederick 8-93, VanHoose 3-46, Stulz 4-42, G. Trampler 1-25, Clutter 3-20, C. Trampler 1-3, Zantene 1-(-3), Total 43-528. PASSING – Miami Trace Taylor 7-19 79. Clinton-Massie Stulz 1-3 35. G. Trampler 0-1 0. Total 1-4 35. RECEIVING – Miami Trace Mayer 5-65, Gilmore 2-14. Clinton-Massie Lamb 1-35.